A freak, midday warm front descended upon the city so I went for a walk. 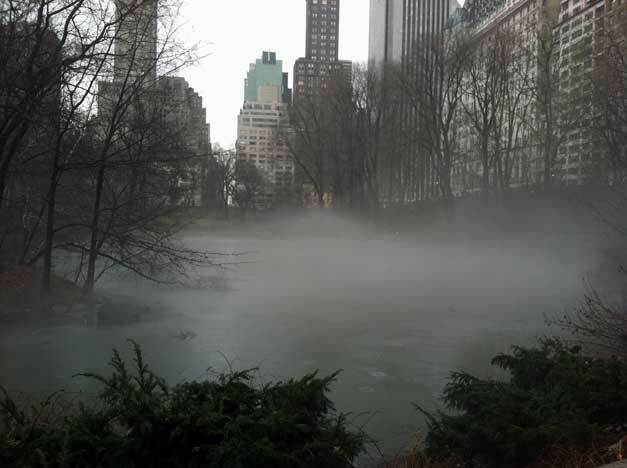 The change in temperature was so sudden and dramatic that it caused a mist to rise off the surface of the pond in Central Park. I want an iPhone 4s because it’s got a better camera than my iPhone 4. I certainly get a lot of use out of the camera feature and my lousy phone doesn’t sufficiently capture the drama of the scene. Clearly, it’s the phone’s fault. It can’t POSSIBLY be operator error. At the end of Mike Daisey’s The Agony and Ecstasy of Steve Jobs, he tells the audience that we’ll never look at our Apple products the same way again. And he’s right. I had always assumed that iPhones, iPads and the like were constructed on long, complex assembly lines by robots, as did Mr. Daisey. That is not the case. Mr. Daisey visited China. He discovered, and conveys in graphic terms, how these devices are painstakingly hand-assembled. The New York Times recently ran a lengthy exposé on how people, some no older than 13 or 14-years old, and with the full knowledge and consent of Apple (and other companies), are being worked, literally, to death. Apple isn’t as benevolent as their P.R. machine would like you to belive. This is a tough, fascinating monologue that weaves three stories simultaneously; the history of Apple, the rise, fall, and rise of Steve Jobs, and the netherworld of disposable labor in China. By the time some of these kids reach 25, their hands are destroyed from years of repetitive motion work on assembly lines. Apple knows. They all know. But they don’t care. I probably wasn’t the only one secretly wondering if Jobs’ early demise was some form of cosmic retribution for the people-destroying machine he created. It was recently reported that at a conference, he told President Obama that Apple manufacturing jobs were “never coming back to the U.S.” Now I know why. Ahh! 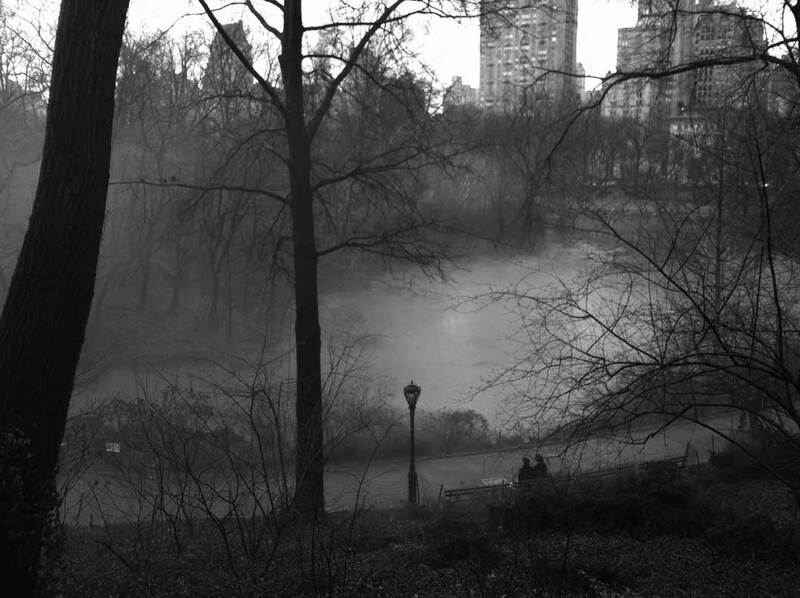 Those misty “Victorian” scenes remind me of places along the Thames in winter.Thank you.And the Apple dilemma? Those who are avowed Mac people will never switch.And, I suspect, many wont care. “It’s China’s problem” is what I hear from so many people.Perhaps China needs a Keir Hardie? 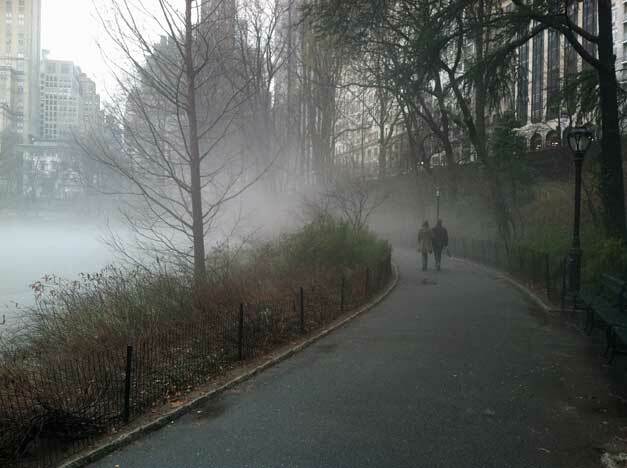 You have mist, we have pea soup fog. For three days in a row now. Makes for lots of accidents. It is 4:30 p.m. and I cannot see anything out my window unless I look straight down at the ground. It’s just… white. (No, it’s not snowing. I’m going to take a photo and post it on my blog. It’s eerie. )I think your photos are pretty good, actually… for a phone. I didn’t know iPhones were made in China.My Blackberry was assembled in Mexico. I don’t know where the components were made. dinah: I’m posting this via my iPhone. One becomes addicted to these things. I feel a sadness but am utterly powerless to change things. Ponita: Thanks for the compliment. Just wait ’til I get an iPhone camera upgrade. I’ll set the blogosphere on fire. sav: As always, I offer the photos at no addition cost to you, the reader. Pat: We have been very, very lucky this year. No biting cold winter this time around. It makes up for the catasclymic blizzards of last year. daisy: Zombies in Manhattan! I wonder if anyone would notice? The tourists in midtown move in a zombie-like stupor. I was going to ask, ‘Knowing this would you continue using Apple products?” But then I realised that I own an iPod and I’m unwilling to part with it. Sid: That’s the trap! We’re all addicted to these devices! Don’t think so? Try doing without for five days. Think you can? Any of you? nurse: They have an old world/Hallmark greeting card quality. Those fotos: fab. As I type on my mac, my iphone on my nightstand, my ipad charging on the desk. Egads. Apple is in serious shite over it’s sustainability record, but until now, no-one has cared. Gonna be interestin’. Beautiful photos Mr UB. Ellie: You know, I got the idea to post black and white photos from you’re place. It’s true!Dolce: daisyfae is correct to point out that MANY companies are guilty of the same thing. Apple just makes for a nice, juicy, high profile target. Shame on the Chinese Gub-ment.JZ: None of this would have been brought to my attention if I had just picked a different play that night. I normally choose entertainment over eduction. MT: See that…ADDICTED! Me too, by the way. Scarlet: You have NOT made your JZ/Cameron observation before! That is a dead, spot-on observation. Well played. Scarlet and TUB: I suppose being married to a Brit eventually takes its toll. ;)Could be my mother’s Irish that’s bleeding through all that extra flesh I’ve gained over the years too….